Xenon is a colorless, odorless, heavy noble gas. It is element 54 with the symbol Xe and atomic weight 131.293. A liter of xenon gas weighs over 5.8 grams. It is 4.5 times denser than air. It has a melting point of 161.40 K ​(−111.75 °C, ​−169.15 °F) and boiling point of 165.051 K ​(−108.099 °C, ​−162.578 °F). Like nitrogen, it's possible to observe the solid, liquid, and gas phases of the element at ordinary pressure. Xenon was discovered in 1898 by William Ramsay and Morris Travers. Earlier, Ramsay and Travers discovered the other noble gases krypton and neon. They discovered all three gases by examining components of liquid air. Ramsay received the 1904 Nobel Prize in Chemistry for his contribution in discovering neon, argon, krypton, and xenon and describing the characteristics of the noble gas element group. The name xenon comes from the Greek words "xenon," which means "stranger," and "xenos," which means "strange" or "foreign." Ramsay proposed the element name, describing xenon as a "stranger" in a sample of liquefied air. The sample contained the known element argon. 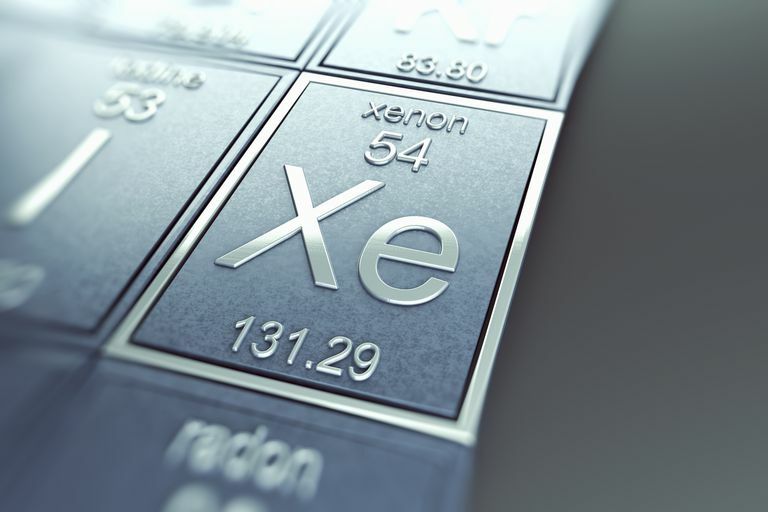 Xenon was isolated using fractionation and verified as a new element from its spectral signature. Xenon arc discharge lamps are used in the extremely bright headlamps of expensive cars and to illuminate large objects (e.g., rockets) for night viewing. Many of the xenon headlights sold online are fakes: incandescent lamps wrapped with a blue film, possibly containing xenon gas but incapable of producing the bright light of genuine arc lamps. Although the noble gases generally are considered inert, xenon actually does form a few chemical compounds with other elements. Examples include xenon hexafluoroplatinate, xenon fluorides, xenon oxyfluorides, and xenon oxides. The xenon oxides are highly explosive. The compound Xe2Sb2F1 is particularly noteworthy because it contains a Xe-Xe chemical bond, making it an example of a compound containing the longest element-element bond known to man. Xenon is obtained by extracting it from liquefied air. The gas is rare but present in the atmosphere at a concentration of about 1 part per 11.5 million (0.087 parts per million). The gas is present in the Martian atmosphere at approximately the same concentration. Xenon is found in the Earth's crust, in gases from certain mineral springs, and elsewhere in the solar system, including the sun, Jupiter, and meteorites. It is possible to make solid xenon by exerting high pressure on the element (hundreds of kilobars). The metallic solid state of xenon is sky blue in color. Ionized xenon gas is blue-violet, while the usual gas and liquid are colorless. One of xenon's uses is for ion drive propulsion. NASA's Xenon Ion Drive engine fires a small amount of xenon ions at high speed (146,000 km/hour for the Deep Space 1 probe). The drive may propel spacecraft on deep space missions. Natural xenon is a mixture of nine isotopes, although 36 or more isotopes are known. Of the natural isotopes, eight are stable, which makes xenon the only element except tin with more than seven stable natural isotopes. The most stable of xenon's radioisotopes has a half life of 2.11 sextillion years. Many of the radioisotopes are produced via the fission of uranium and plutonium. The radioactive isotope xenon-135 may be obtained by beta decay of iodine-135, which is formed by nuclear fission. Xenon-135 is used to absorb neutrons in nuclear reactors. In addition to use in headlamps and ion drive, xenon is used for photographic flash lamps, bactericidal lamps (because it produces ultraviolet light), various lasers, moderate nuclear reactions, and motion picture projectors. Xenon can also be used as a general anesthetic gas.